The cube is entirely cleanroom compatible and allows you to bring content with packaging from cleanroom to cleanroom. Let the cube protect your parts until further processing inside the cleanroom. Keep together unique sets of parts and use the associated cube as a carrier all along the lifespan of the set. The entire C2C Cube range has undergone all possible testing at Nefab’s in-house ISTA test lab. 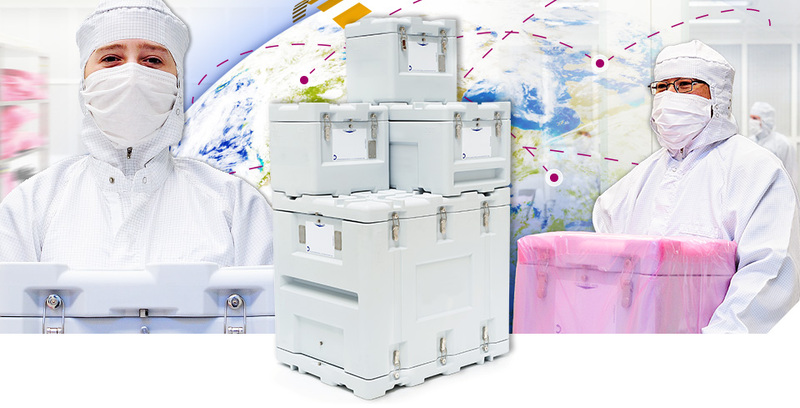 The C2C cube protects your product from contamination and shocks when transporting between cleanrooms. The modularity of the different sizes facilitates multiple configurations of stacking, storing and handling. Custom C2C accessories can improve efficiency further: trolleys, special inserts, fastening plates, ESD protection, temperature isolation and much more. The C2C is a returnable system with a very long life span. With Nefab’s global refurbishing service plan, your C2C Cube will be ready to be used again after each cycle. Nefab provides all inclusive refurbishment: cleaning, replacing, repairing, and modification. This service is available nearby in Europe, USA and Asia. Special runnels keep the belts in place and secure the box, enabling safe, easy handling (manual or by machine). Used to return the packaging in clean condition. Use this on all your product sizes and protect down to 10 G.
To equip the Cube with inner straps or add accessories like special fastening plates. Lift the box manually, even with a protective PE layer around it. Each Cube has an integrated RFID tag and cleanable label surface. The special developed filter regulates the air pressure inside the box in transit without adding a risk for contamination. The C2C Cube sizes are conform to international logistic standards.The modular concept and special stacking features allow you to ship multiple combinations of boxes safely.